Music is more than notes and sound. It is also a technical discipline, cultural artifact, and form of communication. At Brandeis, we take an integrated approach to the study of music that incorporates all these dimensions. 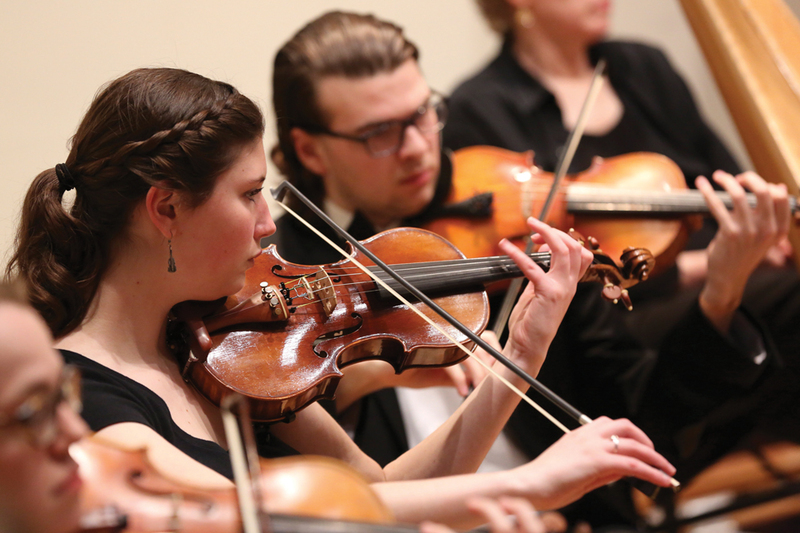 Our undergraduate program combines music history, theory, composition and performance. As a music major, you'll take one to two years of theory and training in musicianship skills, and three semesters of music history. You'll participate in university ensembles and take electives chosen from a broad selection of topics. If you wish to focus on a particular area, you may enroll in one of five specialized tracks: composition, cultural studies, history, performance or musical theater performance. Our music program will not only give you a deep appreciation of the complexity and richness of music—from its basic rules and its range of styles to its performance—but it will also prepare you for a variety of careers. Many of our graduates pursue master's and doctoral degrees in performance, composition, musicology, music production and technology and other related fields. Others go on to become music professors, arts administrators, opera singers, cantors, orchestral musicians, composers, conductors, musical theater directors, TV and record producers, media and digital arts specialists—not to mention doctors, attorneys and teachers. 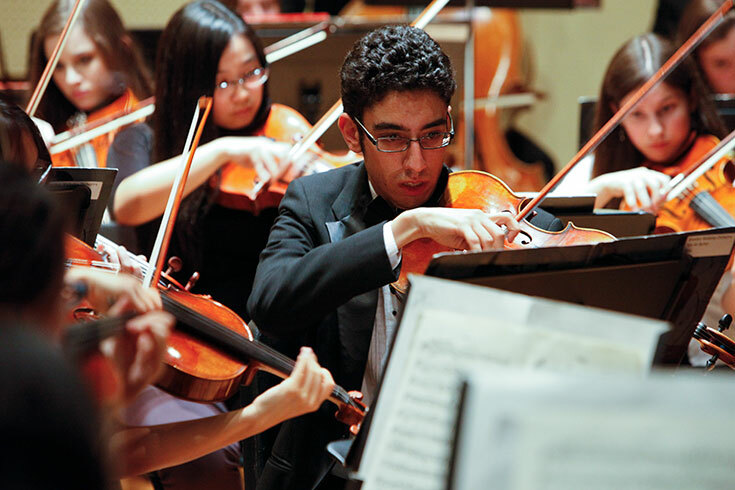 Music is thriving at Brandeis. We have an award-winning faculty comprised of composers, scholars, instrumentalists, vocalists and conductors who will give you individualized attention. We've got a state-of-the-art music center with 30 pianos (in addition to the one Leonard Bernstein played as a child! ), an electro-acoustic studio and a large collection of historical instruments, including a French double harpsichord, a cornamuse and Renaissance flutes. When you're not studying or practicing, you'll have a front-row seat to hear the renowned Lydian String Quartet. And you'll have myriad opportunities to perform with others—whether your thing is world music, early music, jazz, improv, choral, chamber music or orchestra. In keeping with the Brandeis commitment to social justice, we see and teach music as a shared human experience, and a way of understanding others, creating a sense of community, and fostering cross-cultural appreciation. The two-semester Senior Project in Music is your opportunity to complete a thesis, musical performance or composition (or some combination) that is appropriate to the track you’re enrolled in. In all cases, the project must include written work. The Leonard Bernstein Fellowship is a highly selective chamber music program for which you may apply by submitting a portfolio of your work. The fellowship provides a small number of accomplished vocalists and instrumentalists the benefits of private lessons, additional performance opportunities, and a $20,500 renewable scholarship. Our distinguished faculty members have received many awards, including the Pulitzer Prize, a Guggenheim Fellowship, the Koussevitzky Prize, the Aaron Copland Award, the Charles Ives Fellowship, the Naumburg Award for Excellence in Chamber Music—not to mention Grammy nominations. Yu-Hui Chang was a featured guest artist at the Wellesley Composers Conference. Her new, experimental work, "In Gentle Breeze, We Sing," premiered in the Innovation Series at the National Theater and Concert Hall in Taipei. Karen Desmond has co-edited the book "The Montpellier Codex: The Final Fascicle. Contents, Contexts, Chronologies" (Boydell & Brewer, 2018). She is also working on a project that is the first project to encode medieval music in the original medieval notation. A CD of Robert Nieske's "Sonata for Flute and Piano" and arrangements of holiday songs was recorded by Linda Bento-rei, flute, and Vytas Baksis, piano. Each year, you may participate in the Leonard Bernstein Festival of the Creative Arts, a weeklong showcase of music, art and theater. You may apply for a grant in support of your project. Studying abroad is an excellent way to deepen your cross-cultural awareness, which is fundamental to music appreciation. Many music students elect to spend time abroad in places like Tanzania, Australia, China, Austria, England, Israel and Ireland. Through its ties to studios in England, France, Italy and Sweden, the Brandeis Electro-Acoustic Music Studio presents further study abroad opportunities. The musical training you'll receive as you earn your bachelor of arts in music will prepare you well for a master's or doctoral degree in performance, composition, musicology, music production and technology, and education. Jacob Friedman ’12 is pursuing a PhD in musicology at Princeton University. Our recent graduates have become music professors, arts administrators, opera singers, cantors, orchestral musicians, composers, conductors, musical theater directors, TV and record producers, and media and digital arts specialists. Others have become doctors, attorneys, and elementary and secondary school teachers. Rachel J. Peters ’99, a double major in music and theatre arts, has found a highly successful career as a composer, lyricist, and librettist in musical theatre, opera, and musical underscoring. She is the recipient of discovery and commissioning grants from OPERA America, winner of the Anna Sosenko Assist Trust and multiple ASCAPlus awards, a MAC Wallowitch Award finalist, and a member of ASCAP and the Dramatists Guild. In the 2018-2019 season, she will premiere her operas "Companionship" at Fort Worth Opera and "Steve" with Boston Opera Collaborative. Matthew Stern ’08, a double major in vocal performance and NEJS, was music director for the critically acclaimed British production of Stephen Sondheim's Merrily We Roll Along at Boston's Huntington Theater. Now on the faculty of the Boston Conservatory at Berklee, he teaches musical theater, graduate styles and analysis, and vocal repertoire. He received an Independent Reviewers of New England Award as Best Director. After serving as a White House intern in the office of First Lady Michelle Obama, Nicholas Brown ’10 went on to become a music specialist at the Library of Congress and is currently the Director of Special Productions & Initiatives at Washington Performing Art. Composer, clarinetist, and music educator Jared Field ’11 recently premiered "Rachel," a new musical about environmentalist Rachel Carson. Co-written with sister Jessie Field ’13, the musical was accepted into the New York Musical Theater Festival's Developmental Reading Program, and received the Harold and Mimi Steinberg Prize for Best Original Play. Contact Professor Sarah Mead, Undergraduate Advising Head, to learn more about the Music curriculum and requirements for the Music major and minor. Contact one of the advisers below for more information about pursuing a specific track. You might choose the music minor to complement a major in mathematics, computer science, philosophy or another field. See the requirements for the minor in the University Bulletin. "Art Isn't Everything; It's About Everything"
After attending an arts intensive high school, Yoni Battat ’13 wanted to continue his education at a place where he could pursue music as well as other interests. After arriving on the Brandeis campus, he found a quotation on a bulletin board in Slosberg Music Center. Reading these words attributed new meaning to his path at Brandeis. "Art isn't everything; it's about everything."